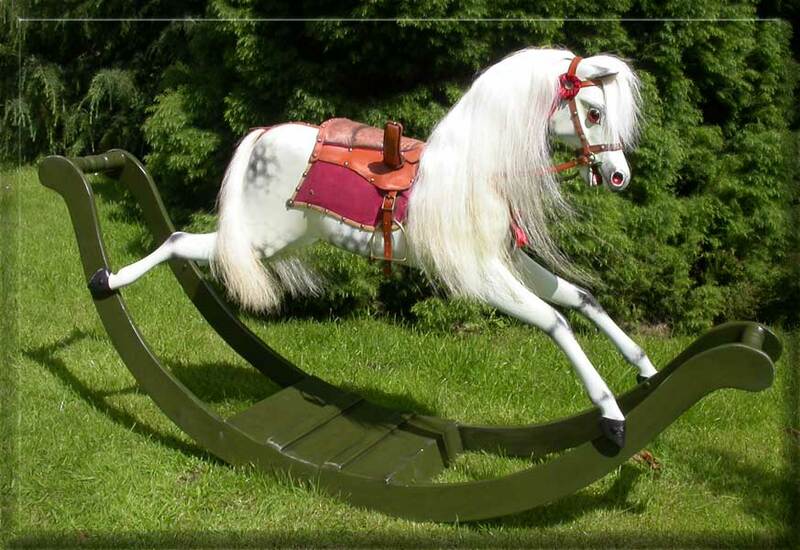 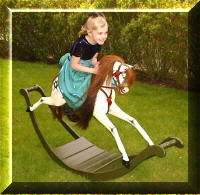 In the late 18th century the rocking horse became popular with wealthy parents for getting their young children used to balancing on the back of a horse. In 1870 the American safety stand was introduced and became popular as it didn't damage furniture and other children's toes. 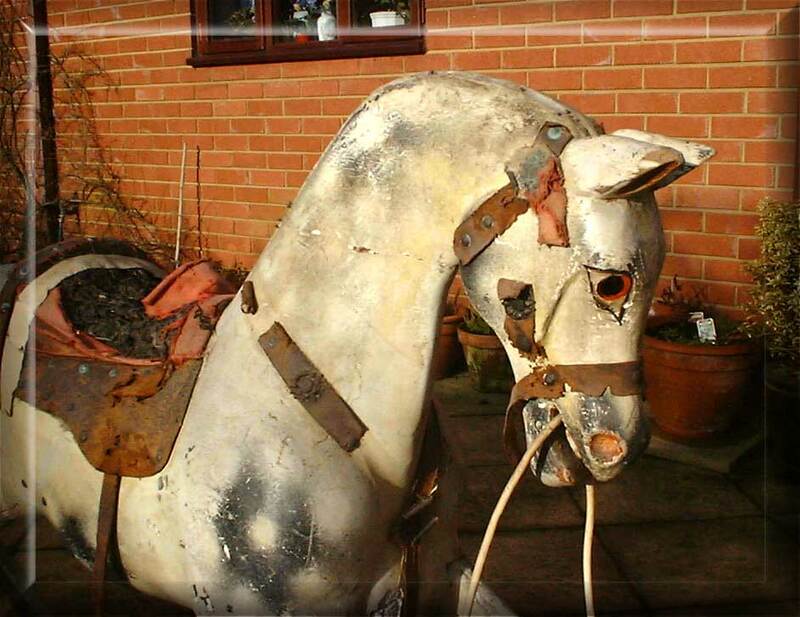 When the horses arrive for restoration it may be just a pile of pieces but virtually anything is restorable using as many of the old parts as possible. 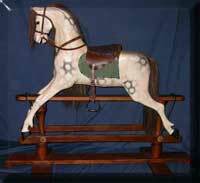 This lovely bow rocker although it arrived looking OK it needed legs repairing, the middle section of the bow replaced due to woodworm, new gesso, repainted, tack and hair etc. 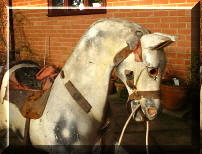 This potentially lovely Ayres Horse arrived complete with splints and damaged/broken limbs and ears. 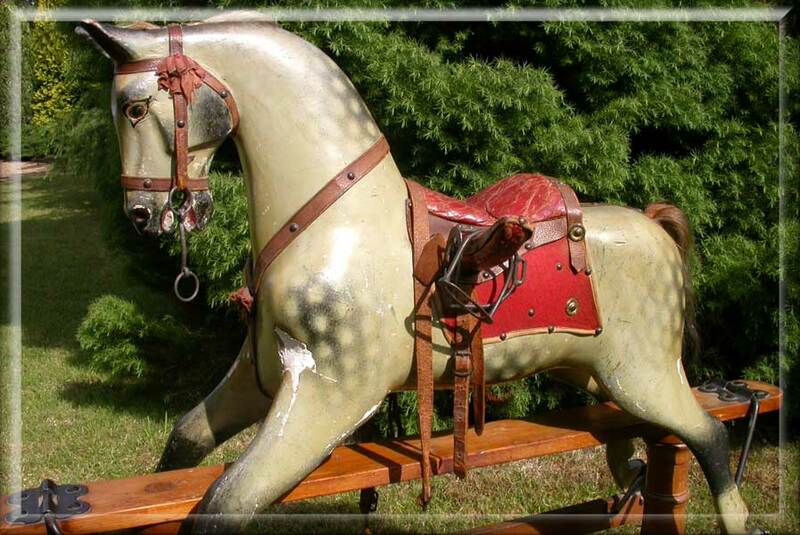 It then had to be completely stripped and refinished. 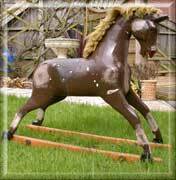 This G and J Lines horse spent many years as a pantomime horse in a local theatre (hence the tinsel and no stand). When it arrived it needed the leg replacing, worm holes treating, stripping, gesso renewed, repainted and tacked. 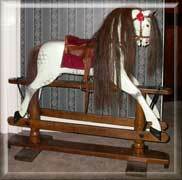 It then went to a family to enjoy as was originally intended. 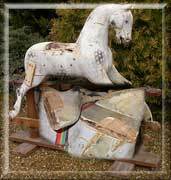 Large Ayres rocking horse circa 1885 which needed a complete restoration. 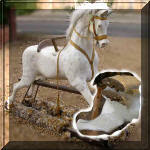 This horse then went to Arkansas, USA. 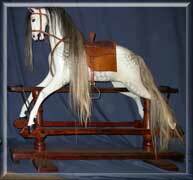 This is another Ayres which arrived in a “piebald” finish and no stand. When the original finish was damaged a lot of fathers because they couldn’t “dapple” just painted an overall colour and then applied blobs. 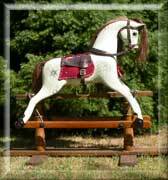 Once again it had to be completely refinished and the customer was extremely pleased. 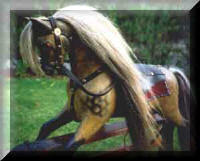 Lovely Ayres horse supplied by Gamages. This was just a gesso repair, touch up etc. 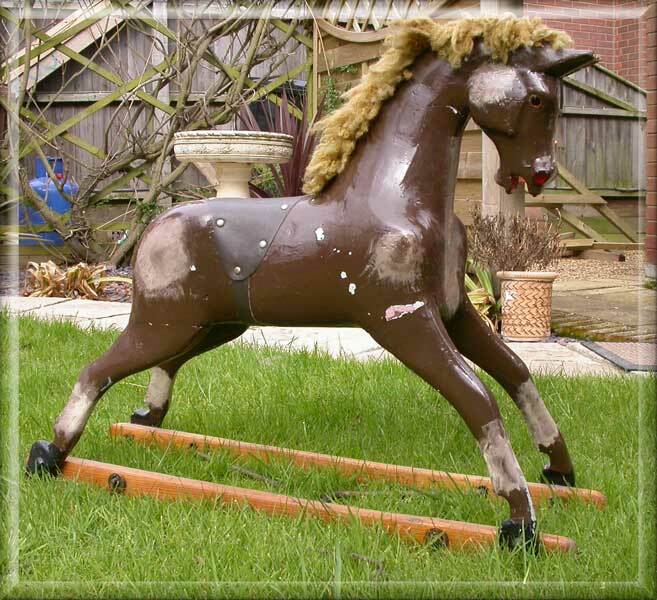 This Leeway horse spent many years in a playschool and was rescued as it was about to be thrown out. It arrived to me in the partially stripped form you see in the picture and it was then restored. 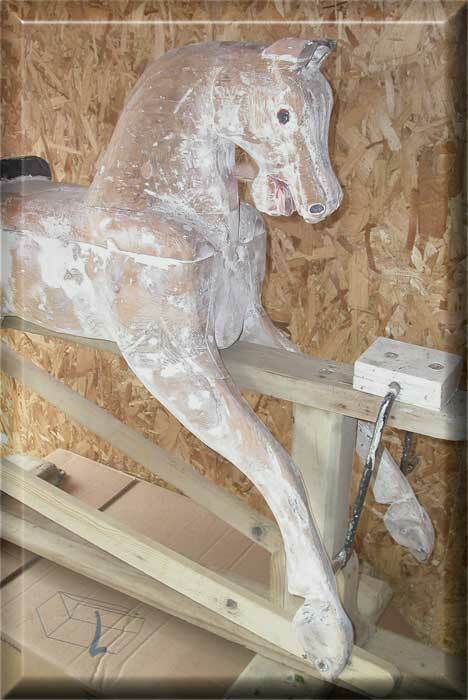 The firm of Patterson Edwards dates from 1892 but we don’t know how many rocking horses were made in the early days. The Leeway trade mark was registered in 1955 and were made until about 1975. This horse was made c 1955 by Collinson and sons who have made horses from 1836 to the present day. 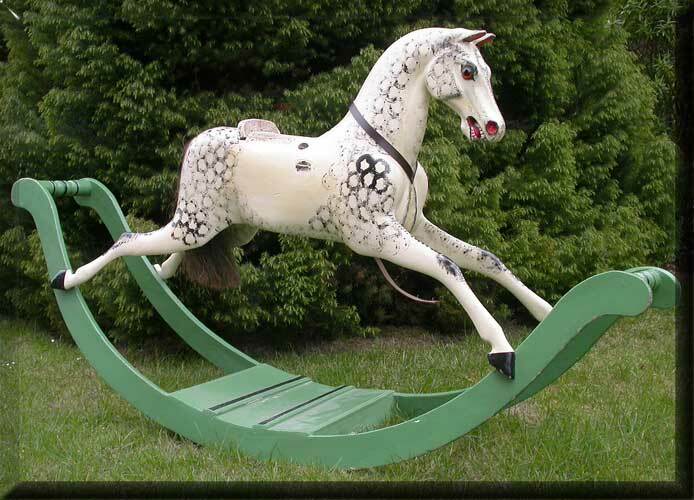 I would have liked to leave the finish as it was but the gesso was in far too bad a condition. 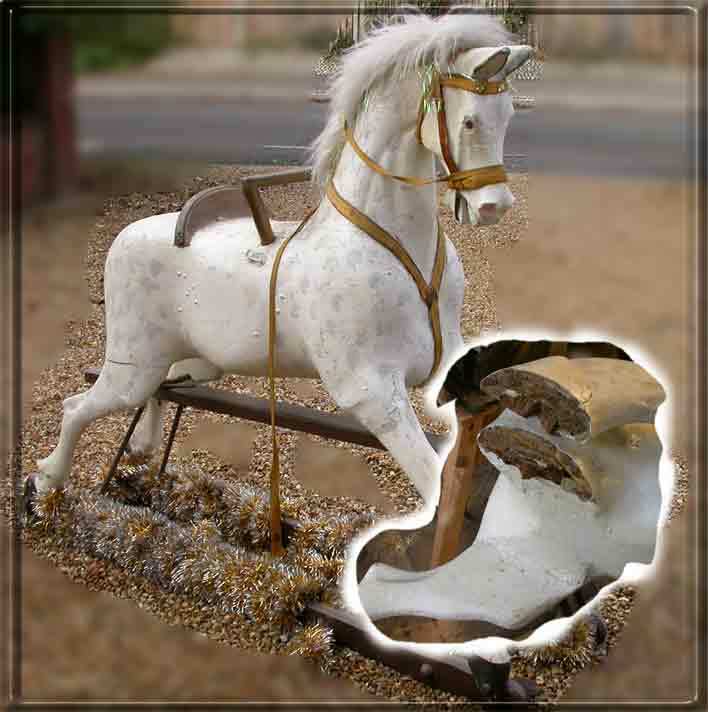 So it had to be stripped and totally renewed as is shown in the above photo. 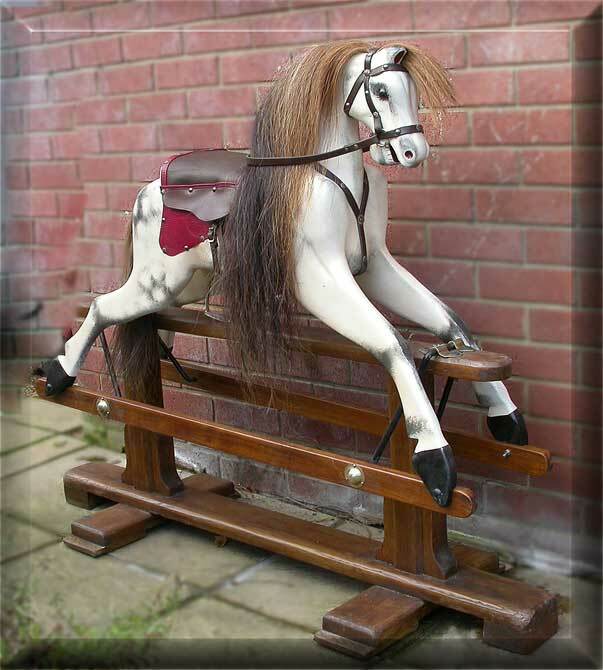 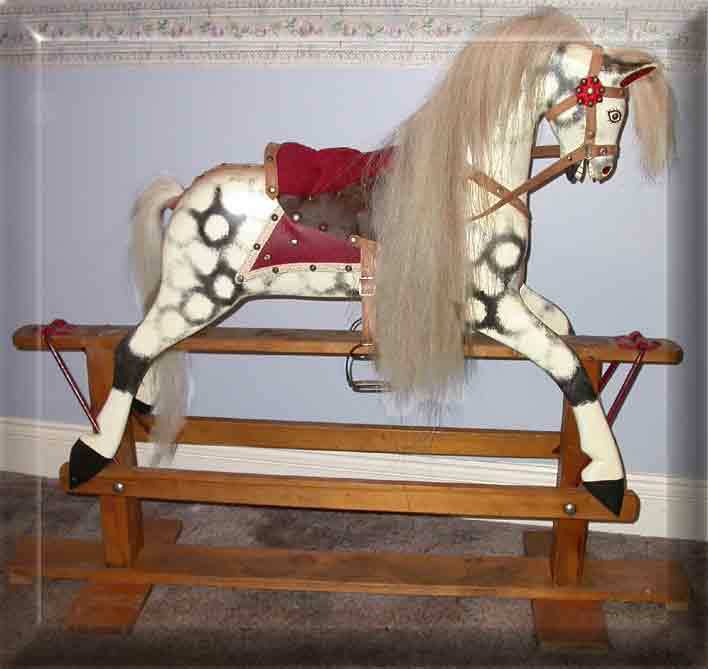 This lovely Victorian horse on rockers arrived with loose joints, worn tack, no hair, in fact in typical condition for a well used and loved heirloom. I stripped it, repaired joints, renewed the gesso, repainted and fitted new tack and hair. 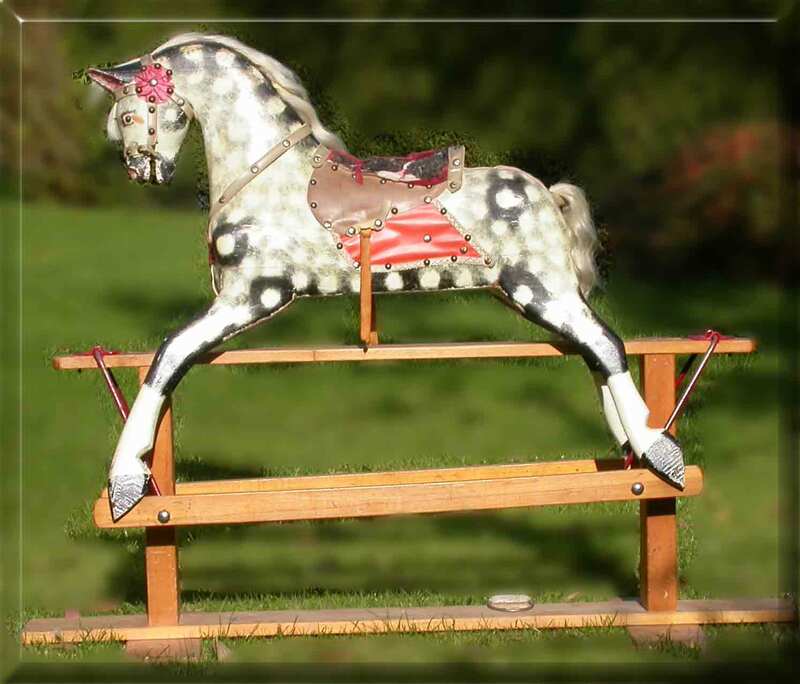 I also replaced the pommels in the existing holes which the customer (although it had been in the family from new) had forgot were fitted originally. 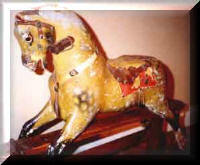 The pictures above show a sorry horse which came in with one ear, nasty cracks, no tack and with worn joints and metal work. 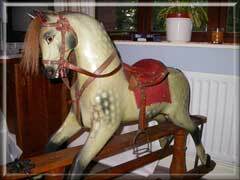 After careful restoration repairing only what was essential it was back to a lovely useable horse.